This robust range of unbreakable ECO-friendly outdoor mirrors with their subtle green frames are designed to blend in with natural foliage or rural environments, offering all the benefits of improved visibility, without being a blot on the landscape. ...see more unbreakable outdoor Security Mirrors, Safety Mirrors and Surveillance Mirrors in our on-line shop. 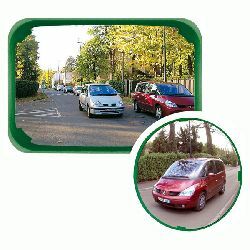 Available in a range of sizes and formats (round or rectangular), each mirror is supplied with a heavy duty fixing kit allowing easy attachment to a post or wall (or other flat surface).